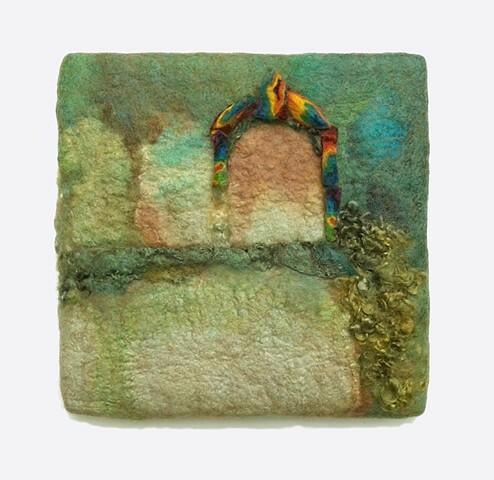 Sharron Parker began her career as a weaver but prefers the freedom of working in felt, which is not restricted by tools or equipment. She became interested in felting in 1980 when she saw an exhibit of ancient Siberian felts which had been preserved in the permafrost. Sharron buys pre-dyed (colorfast acid-dye) unspun wool and combs out the fibers into piles, allowing her to build up layers of colors. Moisture, heat, and pressure are the three main variables involved in felting. I use the ancient technique of feltmaking not to capture what I've seen directly, but to create something new. The simplicity of the technique-combing, layering, and working dyed unspun wool in hot water until the fibers lock, allows me to work spontaneously, and often experimentally. The shape of a piece might come from crystals under a microscope, a line from the sinous edge of a pond meeting the shore, and the texture from the bark of a birch tree. I wish to celebrate nature not to mirror it.